But Vega and other experts see big things for wave energy. 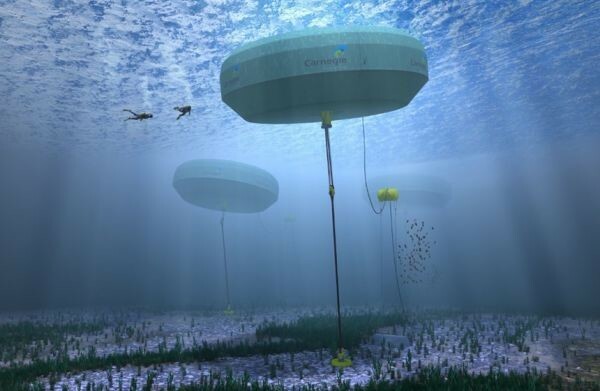 If they’re right, arrays of wave energy converters moored along coastal regions of the U.S. will be providing power to millions of homes in coming decades. What these devices will look like — and exactly how they will work — is anybody’s guess. The Lifesaver has an onboard electrical generator driven by the up and down motion of cables that stretch from the bottom of the device to the ocean floor. Other converters resemble large snakes and harness wave energy via hydraulic systems activated by the movement of jointed segments; still others resemble giant underwater metallic balloons and feature pumps that pressurize seawater to power a hydroelectric turbine back on shore. Some operate close to shore and are visible from land, while others operate in deeper waters. One thing is clear: Wave energy is a vast, untapped resource that could help reduce our reliance on fossil fuels. Just how dense? Every square meter of a solar panel receives 0.2 to 0.3 kilowatts of solar energy, Alam says, and every square meter of a wind tower absorbs 2 to 3 kilowatts. Every meter of the California coast receives 30 kilowatts of wave energy. Wave energy has another advantage over solar and wind. Waves are easy to forecast, Brekken says. And unlike solar, which works only in daylight hours, wave energy can be harnessed 24/7. The latest research suggests that wave energy in the U.S. could produce up to 1,170 terawatt-hours a year, or nearly one-third of the country’s total electricity usage. Recognizing this vast potential, the U.S. Department of Energy (DOE) is investing heavily in wave energy. Last year, the DOE awarded $2.25 million to winners of a wave energy converter design challenge and $40 million to Oregon State University for a new grid-connected wave energy testing facility. The future is battery-powered. But are we overcharging the planet? Brekken offers a cautious assessment of the real-world potential of wave energy, predicting that it will ultimately contribute about 6 percent of the nation’s total electricity production (similar to hydropower). Such caution stems, in part, from the many engineering hurdles that must be overcome before wave power becomes viable. The marine environment, with all the water, high winds, and violent waves, is tough on even the most robust devices. And deploying and testing wave converters requires vessels and divers, which only add to the cost of deploying the devices.